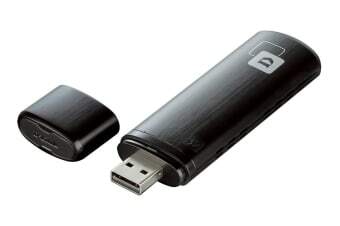 The Wireless AC1200 Dual Band USB Adapter (DWA-182) delivers powerful wireless AC technology to your desktop or notebook computer. Simply plug the adapter into an available USB port and connect to a wireless network to access a secure, high-speed internet connection – 2.4GHz (300Mbps) or 5GHz (up to 867Mbps). With integrated Dual Band technology, you’ll have reduced Wi-Fi interference to maximise throughput for faster streaming, gaming, and VOIP calls. Use Wireless Protected Setup (WPS) to quickly and easily establish a highly secure home network that will have you browsing, streaming and watching in minutes. The latest encryption technology ensures that information transmitted on your network remains safe and secure, while preventing unauthorised access. It’s as easy as push and connect! The DWA-182 also supports the latest high-speed USB 3.0 specification. When connected to a compatible USB 3.0 device and using the 5 GHz wireless band, the device will automatically switch to USB 3.0 mode, allowing you to achieve the highest possible data transfer rates and fully utilise the speed benefits of the Wireless AC standard.